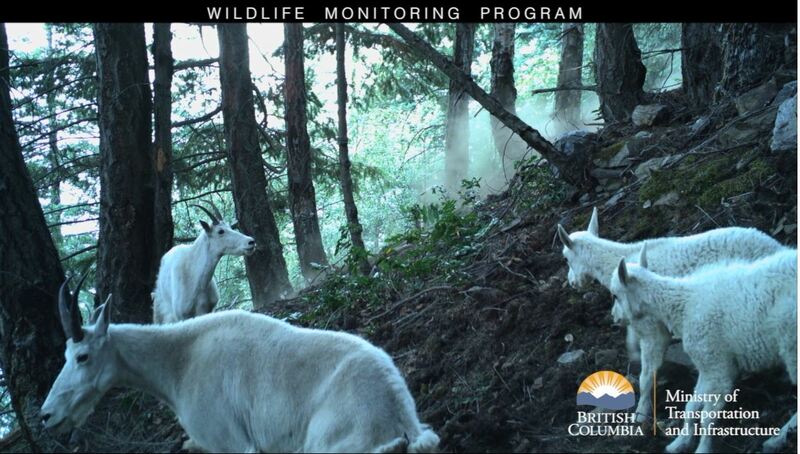 A feisty herd of BC mountain goats were thrilled to discover a salt patch had magically bloomed, seemingly overnight, in a bluff of trees near Nelson. They got straight to work licking the salt, with no further concern for their old salt spot along Highway 31, with its zooming traffic. This “intercept” salt lick was the brain child of the ministry’s wildlife specialist looking for ways to prevent the animals from hanging around the highway, where they are at risk of being struck by a vehicle, in search of a salt fix. Now that the temptation to travel toward the highway has been nixed with the intercept, these goats have no reason to travel beyond the “salt lick bluffs”; their natural range was only extended to the roadside by the promise of a salty treat. We are looking at other highway locations where wildlife is tempted by salt to see if this approach will work elsewhere. Stay tuned! Watch our feisty friends in action below, or here on YouTube. – Wildlife such as big horn sheep, moose and deer seek out salt deposits to get essential minerals and nutrients in the spring time to help with bone and muscle growth. – We worked loose, coarse livestock salt into patches of the forest floor to build this salt lick. – These videos were captured in the springtime, while these goats were busy shedding their heavy winter coats in favour of a lighter spring look. Do you have any questions about this, or any other work we do here at the Ministry of Transportation and Infrastructure?Let us know in the comments below. Ahhhhh this is the cutest!!!!! Thanks for posting this TRAN. Really glad there are initiatives to keep the animals safe. Watched Rocky Mountain Bighorns lick salt off the side of a vehicle stopped to look at them. This was on a back road. A big salt Popsicle to them eh? This is great. I have a question whether this just putting salt blocks in strategic locations in spring or is there actually any habitat alteration that is done to create a year round lick? Hello Edward – we have sent your question to our wildlife biologist. We will let you know as soon as we have a response.